I have been wanting to do a guide about Dish Development in Cafe Nippon, but you know me, I try and avoid posting guides. >_< Anyway, I will give it a go here. Use Aged Cheese ( one Ingredient only ) to develop, creating the final Dish with all Inner Sats 100. Next, we will talk about the details. If we mix ingredients that are either Bad or Doubtful, you will see a massage popping up half way of the development saying they are not compatible. If we choose a combination that are either Good or Perfect, we get a message saying they are compatible. Price is generally effected by the rank of the ingredients. If we pick Gold Flakes, we can almost always get a Price Increase. However, in the later play-throughs, I realized Taste, Appeal, and Price are a little random. It can generate different results even if we use the same Ingredients on the same Dish. That's when I realized I should focus on the Inner Stats first. Inner stats are totally predictable. You can even work out how many times you need to develop the Dish to make it perfect. 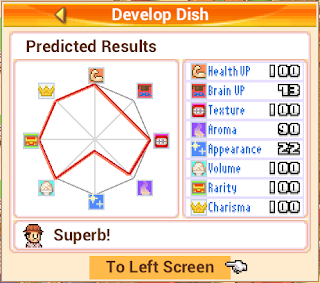 Each Dish has 8 Inner Stats : Health Up, Brain Up, Texture, Aroma, Appearance, Volume, Rarity, Charisma. Each Stat is represented by a number, from 0 to 100. So you can see, it's not adding two Ingredients' Stats together and then add to the Dish's Stat. 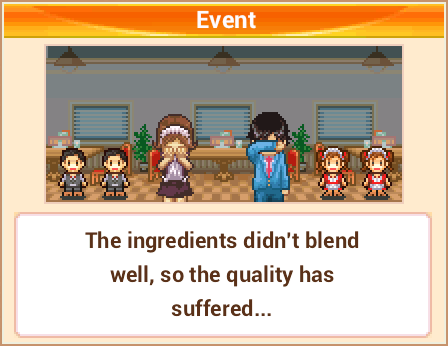 That's why we can get different result when we put the Ingredients in different orders. Notice numbers are capped at 100. 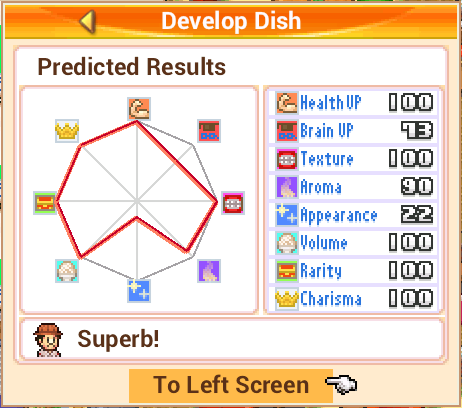 In most cases, when Inner Stats all reach 100, the Taste/Appeal/Price are also at their maxed values. ( Taste/Appeal/Price Caps ) However, sometimes Taste/Appeal/Price are not yet capped. When this happens, I simply Develop the Dish without any Ingredients. Eventually they will be at the capped values. I sometimes throw in an Aged Cheese to increase the chance of making Taste/Appeal/Price capped. Chef's Cooking skill effects the time needed for Dish Development. A Chef with 999 Cooking skill can finish developing in one night. Simply Develop a Dish without any Ingredients to make a "Copy" of the Dish. Best Ingredients for Dish Developing? Thank you, Cho. Which game are you playing next? Sushi Spinnery or Kairobotica? I have been playing Minecraft recently but I heard Kairobotica is great fun to play. The price is kind of random in the way that you can't really predict the exact result. However if we pick the ingredients that would increase the overall result ( for the inner stats ), it should be safe to say the price won't drop. Thanks for coming by again. It's so nice to hear from you. Remember to rest your eyes and fingers after playing the games for a while. :p Have a good weekend. I love the Sims. I've only played the first one when it just came out. It was good fun. I recognize a few Japanese Characters that's about it. There are some common characters between Japanese and Chinese, so it helps a little bit. But, no, usually Google helps me work out roughly what it means. Do you speak any other languages? Enna, are you playing these games on Android or iPhone? Love your guide- very detailed! Just one question- right now I have the sharks fin soup at level E for both taste and appeal stats! 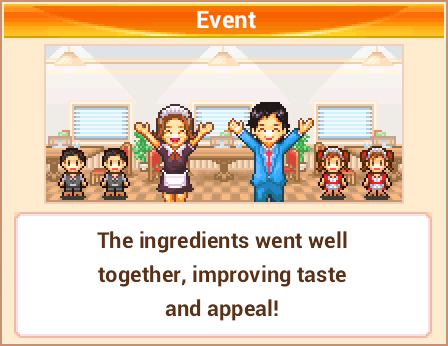 I try upgrading with compatible ingredients but it ends up only "+0" for all 3 stats! Even when I choose to develop the dish with those ingredients it's all "+0"! What am I doing wrong? Hope you can help! Thank you! Did you mean upgrading from the dish menu? I haven't had much experience doing so. I usually just develop the dishes. If I had to guess though, maybe you need to use higher rank compatible ingredients to upgrade more. Also, try and focus on the inner stats ( Brain up, Health Up, Taste...etc. ) first. And the taste/appeal/price will raise later. Sometimes those three don't change if the ingredients don't have much effect on the inner stats. When you develop dishes, just ignore the compatibility. The inner stats are the ones that really matters. If it is still giving you a hard time, I might need to see more details to be able to help out. Good luck! Alright Enna will try that! We can only improve dish qualities through dish development. When dishes have good stats, customers will like them more and you'll get better rating. And all the effort will bring more customers and $$. Hello Enna, Thanks For The Guide, It Really Helps Me Out! Haha. Just started playing the game too. Thank you for the guide..well done.